Wind riffles the surface of the bay. Kayaks glide across it. You turn to your hiking partner and smile, both realizing that Antarctica is more beautiful that you had imagined it to be. The images before you dominate your new ideal, and permeate your senses. Your own will and these snowshoes attached to your feet brought you atop this snowy piste for the best views of mountains, icebergs and glaciers. This landscape will forever change the way you see Antarctica. With the highest staff to passenger ratio in the expedition cruise industry, we are able to offer the freedom of creating individual experiences every day. 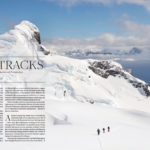 On early season voyages, our professional guides plan your hike through the accumulated Antarctic winter snow. With our extensive experience in the Antarctic peninsula region, we always have good hikes in mind. With snowshoes, we access to breathtaking panoramic views unimpaired by waist deep powder. Where possible, our snowshoe hikes will be one to three hours in duration and will, at times be challenging terrain without the assistance of trails. There are options on most excursions for shorter walks, often up to excellent viewpoints, that don’t require snowshoes or any other equipment. We provide snow shoes and have trekking poles onboard for your use, which provide increased stability and balance when using snow shoes in deep snow. Although our hikes take place only in areas where we have deemed it safe to travel, our guide does carry safety equipment. It is best to be outfitted with comfortable and warm socks to wear inside the Gill boots we provide. In addition, it is good to have a small backpack in order to carry some water and an extra layer of clothing in case the weather changes. 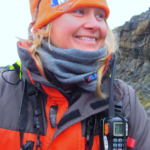 Eva is a core One Ocean Expeditions’ team member working as a program coordinator and/or assistant expedition leader. Having played an integral part of the programming development onboard, Eva is extremely familiar with the activities and conditions in Antarctica and has guided trips along the Antarctic Peninsula for the last seven years. Her expertise and quick smile ensures the best experience for all guests. ‘Off the Beaten Track’ offers an incredible variety of activities. 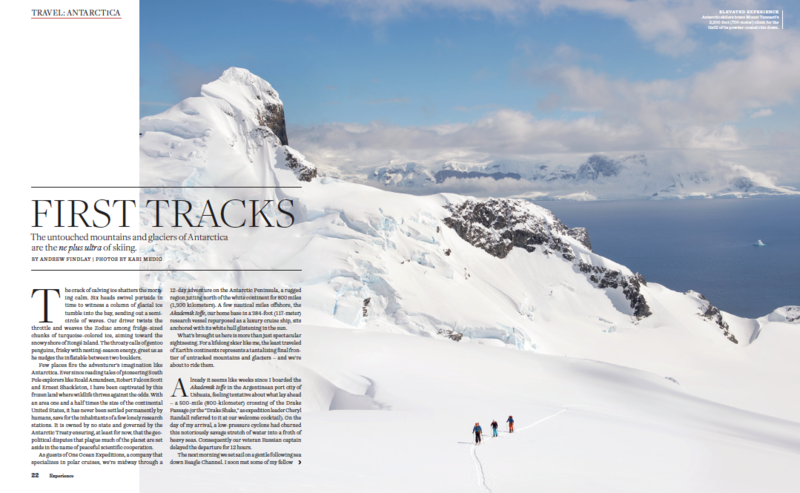 FIND OUT MORE about the whole ‘Off the Beaten Track’ experience in Andrew Findlay’s ‘Fresh Tracks’ article. Previous Post Why travel to Antarctica in February and March?